Known as the ‘Queen of the Music Hall’ Marie Lloyd’s career spanned 40 years. She first appeared at the Eagle Tavern in London aged 15 as Bella Delmare, singing ‘My Soldier Laddie’. 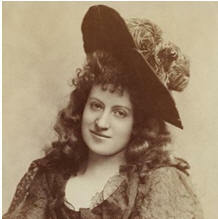 By 1885 she had become Marie Lloyd with her hit song ‘The Boy I Love is Up in the Gallery’. 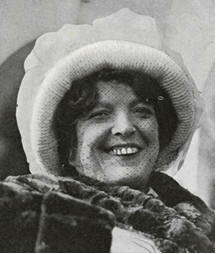 She was a huge success and topped the bill at the West End music halls. The Evening Express reported on 29 June 1894 "Whilst Miss Marie Lloyd, the star of the Newport Empire programme, and a lady friend were having a dip at the public baths on Wed- nesday a quietly sensational incident occurred. Both the visitors were, it is stated, able to swim a little, but when they struck out into deep water they fouled one another, with the result that Miss Marie Lloyd went under, and losing her presence of mind, got into difficulties. Her companion became excited, and called for help. One of the attendants—George Moore—went in. and helped the music-hall star out of the water with the aid of a pole and triangular lift, kept for the purpose. Miss Lloyd appeared none the worse for her adventure, and took her accustomed turns on the stage at night. Lottie Collins began her career in 1877 in a skipping rope dance act with her sisters as 'The Three Sisters Collins'. While in America in 1891 she heard what was to become her trademark song, ‘Tar-ra-ra-boom-der-ay!’. She sang it at the Tivoli in London and it became a major hit. Lottie would pause after the demure first verse and then whirl into an uninhibited version of the skirt dance. Although she performed other songs and sketches, Lottie was forever associated with her one song. The exhausting nature of the dance may have contributed to her early death in 1910 at the age of only 44. The same newspaper on 16 July 1892 "Mary Ann Murphy, a lady with a shawl over her head and partly concealing her features, was before the Newport Magistrates in petty- essions assembled yesterday, on a charge of being drunk and disorderly in Church-street, Newport, on a recent evening. The lady, who made her 30th appearance, did not deny that she was bibu-lous and garrulous, but alleged that the officer (P.C. Kear) was a worse sinner. This she enun- ciated scornfully and in loud tones, and when the Bench adjudged her one month's imprisonment, without the option of a fine, she turned to go down the dock stairs, singing in defiance the following impromptu song "Ta-ra-ra boom de-ay, I've got a month to-day; Ta-ra-ra boom de ay, I've got no money to pay."